I've never been one for a dash mount for my devices. Besides making it too obvious for my 'cargressing', it just can be a little intrusive, especially when we have larger phones. But, I just found a great usage on my latest trip. I'm sure you can guess what it is via the above image (for those of you curious, I was watching Mission: Impossible - Rogue Nation - it was really good!). Before I get into that tho' I should mention that before you look at placing it on your windshield you should definitely take a look at the legislation in your area. Having something that 'obstructs your view' on the windshield could mean you'd get a ticket. But, for some reason, putting it on the dash is okay. If you're unsure. Talk to your local enforcement officer, I'm sure they'll be happy to tell you what is acceptable, and you'll save yourself a fine (as the distracted driving fees just seem to keep going up and up). 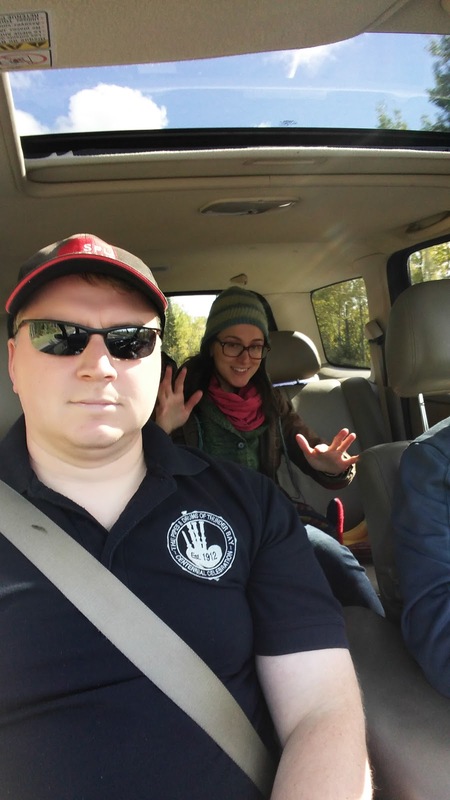 GPSTracklog has a great run down of most of the laws for the US and Canada. Give it a read here. 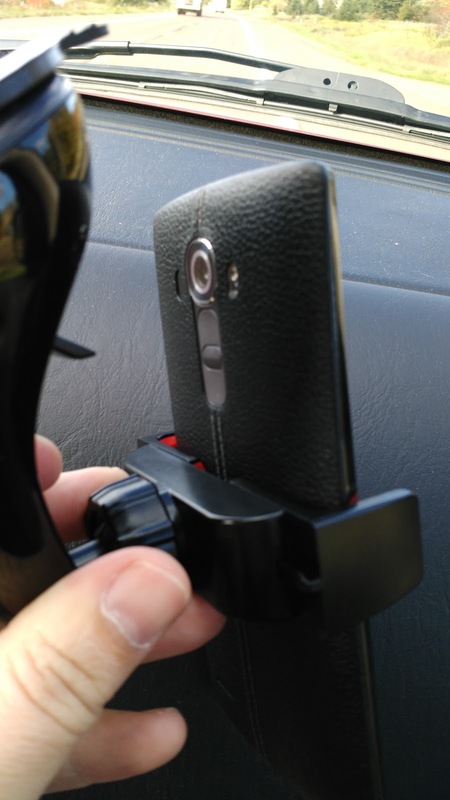 Okay, now when you look at a car mount, there's 2 things I need to ensure. The holder can handle a bigger phone, and it'll hold it well; and that the sticky part sticks. To the part about sticking to whatever it's supposed to stick. My old one I used to have for my Palm pilots used to always fall off. Especially in the cold. And I live in a cold environment for most of the year (well... maybe not most, but definitely longer than I care to admit). This has not just a regular piece of plastic, but it's almost textured like that gecko-skin kind of stuff. Once the suction was engaged (i.e. you push it against the glass and then push the button) it stays. I set up the holder on the rear passenger side window for the back seat of a road trip and it stayed the whole drive (about 6.5 hours). And getting it off was still hard to do. The road was cold and bumpy, but didn't deter this plucky little mount. 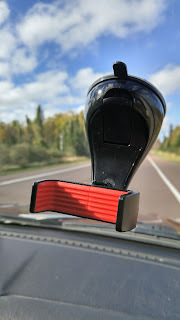 For those of you wanting to put it on a dash (probably what I'd recommend, unless you use it like I did and use the back seat windows) it comes with a sticky pad for you to place on your dash and then the suction will work on that material. My other concern is how well the arm will hold the phone in its grip. I don't want something loose that my phone will jostle out of, or the hinge to be too loose and then it points to the floor. The clamp is really good. It just fits my LG G4 and holds it tight (it says up to 5.3" size so I was a little curious how it would do). A little bit of a spring or something in there really does a good job of not letting go. The ball joint hinge holds onto the angle quite well. Like I said it lasted a long car ride of some not so great areas and it didn't lose its place. So, which brings me back to the point of ... this really works. I don't know why I haven't thought of putting something like this in the back seat before. Opens up a whole new realm of possibilities! Yay! 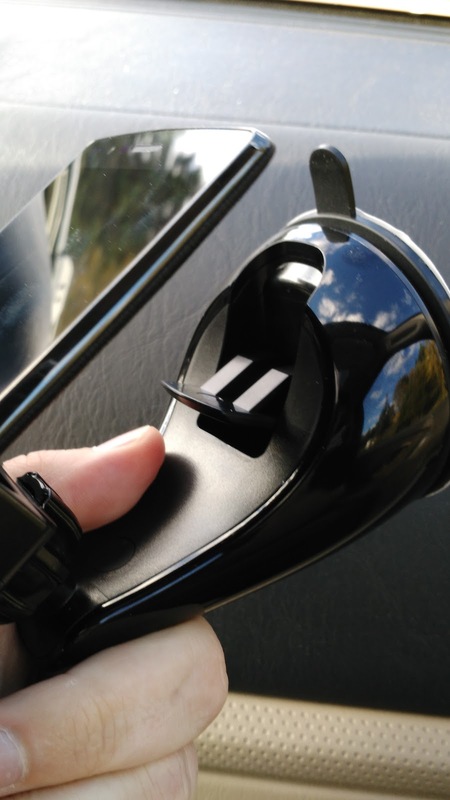 Even better, pair it up with their Toraux cable to plug your device into a portable speaker, or the car stereo, and you can have a great little mini theatre.